‘Kahani Mela’ was organized by Organization for Early Literacy Promotion (OELP) in 3 villages of Kalyanipura, Patan and Chundari on respective dates 25th, 27th and 29th May’ 2017. The motive of these fairs was to reconnect children with the world of books through engaging them in various related activities and tasks. The main thing about these three events is that the community was actively involved in these fairs. Many arrangements were made in the villages of Kalyanipura, Patan and Chundari with the help of Sarpanch and community, in which the youth, children and the elderly from the village also took part in arranging for tents, food and presentation for the event. This event included not only role plays, puppet shows and poem recitations, but various other activities were taken up to connect children with story books and facilitate their overall development. Also, during the preparation of the event for the last one month, students were encouraged to know about the history of their village and gather local village stories from their elders to connect them with their cultural roots. 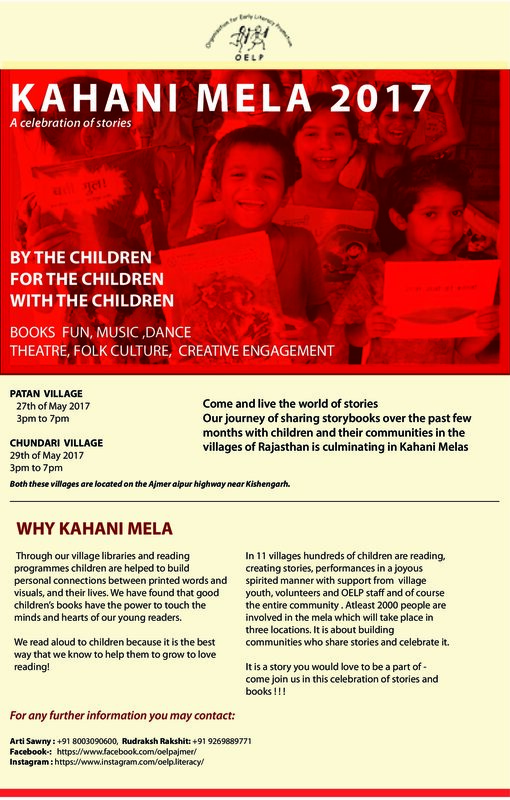 Kahani Mela was divided into 3 interactive sections which are Padho, where a small library was created so that children and adults could come and read books peacefully; Dekho, which included display of material made by students like story boards, three dimensional storybooks, best out of waste, puppets, map of the village, history of the village, interactive charts and various other things; and Karo, where children and youth could come and engage in various interesting activities like drawing, painting, puzzle solving, story making from words etc. Various guests like village Sarpanch, School Management Committee members, government officials, members from Social Work and Research Center, Tiloniya arrived to attend the events. Members from NGOs like Pratham, Eklavya and Manthan, also attended the event along with Delhi and Gujarat volunteers who gave their support in working with children and organizing the event.